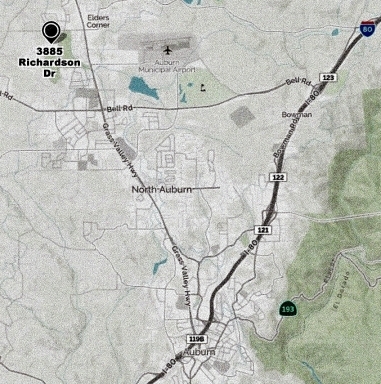 Going east on I-80 toward Auburn, take the Hwy 49 exit toward Grass Valley. Turn left onto Dry Creek, then left onto Richardson. The church is on the right, the park directly across the street on the left. Going west on I-80 toward Auburn, take the Bell Road exit west. Turn right on Hwy 49, then left onto Dry Creek and left onto Richardson. The church is on the right, the park directly across the street on the left.